Philip Haney interview with Glenn Beck at Mercury Studios, Dallas on May 17, 2018. Philip Haney studied Arabic culture and language while working as a scientist in the Middle East before becoming a founding member of the Department of Homeland Security in 2002 as a Customs & Border Protection agriculture officer. After advancing to an armed CBP officer where he served several tours of duty at the National Targeting Center near Washington, DC, he was quickly was promoted to its Advanced Targeting Team, an unprecedented accomplishment for an agent on temporary duty assignment. Officer Haney won numerous awards and commendations from his superiors for meticulously compiling information and producing actionable reports that led to the identification of hundreds of terrorists. He has specialized in Islamic theology and the strategy and tactics of the global Islamic movement. A phenomenal book that everyone should read! 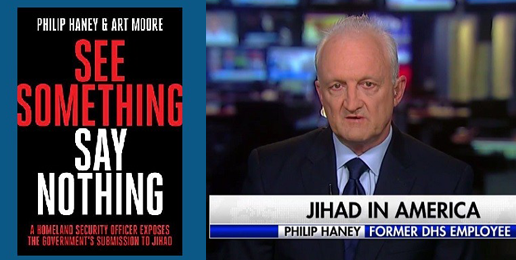 Had Philip Haney been given the time to do his job, he could have had a huge impact to stop some of the terrorist attacks America experienced during his tenure at Homeland Security. Instead, they attacked him verbally and threatened his final years on the job. He retired in July 2015. Next articleKatie Hopkins in Detroit: Can Patrick Colbeck turn Michigan around?